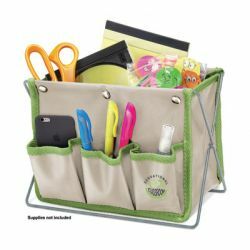 All your “stuff” at your fingertips with this desk organizer! This desk organizer is designed to fit into any classroom décor. The desk organizer sits up on a metal wire frame in galvanized silver finish. The frame folds flat for storage during the summer. The “pouch” features 3 front pockets for markers, pens, even most smart phones fit! The main section opens to a big 7”H x 9.5”W x 7”D. Room enough for rulers, pads, classroom rewards, scissors and all the things you want handy. The pouch is made of a heavy-duty polyester fabric in Tofu color with Greenery color piping accents.